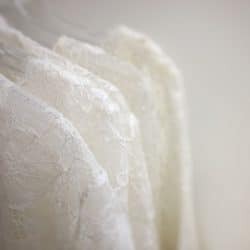 Choosing the right length veil can often be an extremely confusing experience for brides! For starters, the terminology will seem rather strange at first. It’s not so bad with shorter veils – they’re called things like “Waist length”, “Fingertip length”… fairly self-explanatory. But as they get longer this changes to “Chapel length” and “Cathedral length”, which isn’t quite as easy to visualise. Secondly, there’s an old fashioned habit of measuring veils by adding both layers together. The problem with this, in our opinion, is it assumes all brides are ordering two layer veils, which, nowadays is not the case at all. In fact, we sell an equal number of single layer veils, to two layer veils. You would only need a two layer veil if you plan to wear the veil over your face for the ceremony, and this isn’t as common as it used to be. So, what we do is pretty basic. We just tell you the actual length of each layer from top to bottom, in inches. That way, if you’re measuring yourself at home, you know it’s the length shown on the tape measure, and you don’t have to add anything on or do any complicated jiggery-pokery. In brackets next to the two layer veil lengths, we’ve added the combined length of both layers. We include this so if you’ve been given a measurement by your dress shop, you may find a figure you recognise there. Our shortest, sweetest length. 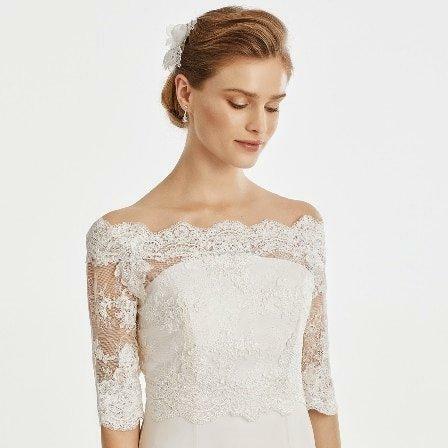 A token nod to tradition without taking anything away from the dress, a single layer shoulder length veil will end just at the top of your dress and provide a touch of softness to your look. The two layer version has a little more fabric that will sit prettily across the shoulders. The size and shape of this short, quirky veil makes a great pairing for tea length dresses. Elbow length veils are another great option for brides looking for a short veil, but with a touch more flow than the very short shoulder length veils. This length looks great with a vintage 50s 60s bridal look. The two layer version in this length has a 20 inch blusher. If you’re hoping to wear your veil over the face, you may wish to go for waist length which has a slightly longer top layer able to reach further over your hair and headpiece. We’re now reaching the more traditional lengths. 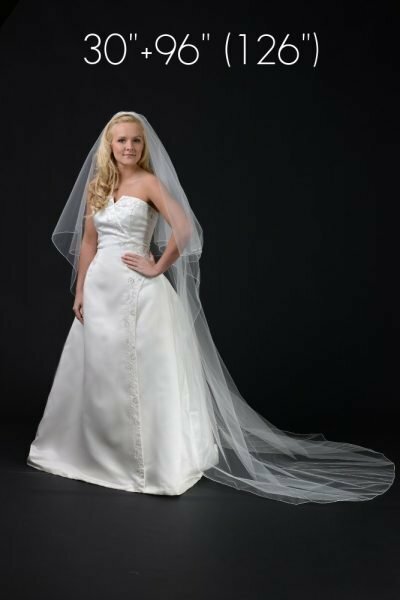 Often, in dress shops, this waist length veil would be the shortest length available. It’s sometimes described as elbow length as well so just check the measurements. If it’s around 54 to 55 inches total combined length of both layers, it would be classed as waist length on our chart. Depending on where you wear this length – i.e. 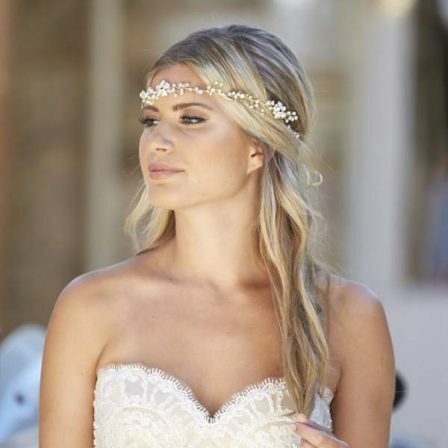 right on top of the head or closer to the nape – it will sit around waist level on most brides. If your dress has a corset back or a detail that extends down lower than waist height, we would suggest not visually cutting that detail in half with a shorter length veil. Instead, the hip or fingertip length (or longer) would be more suitable. The hip and fingertip length veils create a very similar effect. In bridal shops, the lengths typically skip from waist (54 inches) to fingertip (72 inches), but we felt there was a need for an in-between option. Call it a “petite fingertip”, if you will. 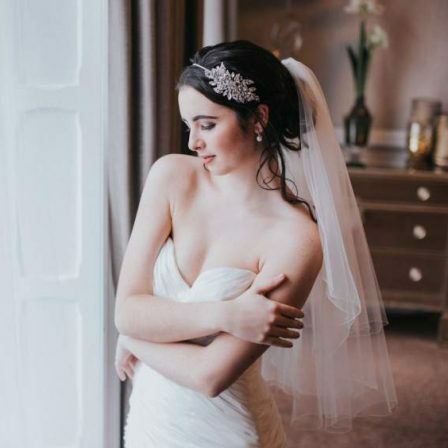 When we try on veils with brides in our boutique, we often find that for brides 5 foot 4 inches and below, a hip length veil worn at the back of the head, as is currently popular, can actually look more like a fingertip length veil. 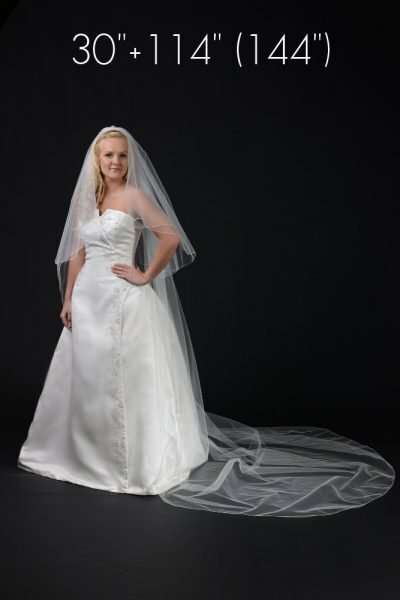 The two layer hip length veil is the first length with a full size blusher at 30 inches. It’s a gorgeous, floaty length that you could happily dance the night away in. 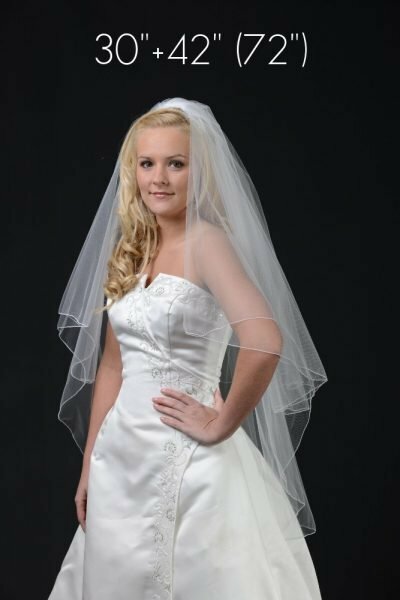 If you choose a veil that is centre gathered, like our picture, you’ll also have pretty side pieces that will sit around the arms and shoulders if desired. This length would be great with a corset back dress as it would finish just underneath it. One of our two best-selling lengths (the other, chapel), fingertip length is the last of our standard lengths before we get to the veils that reach the floor. It’s an ideal length for mermaid style gowns as the veil ends at fingertip level just before the skirt kicks out at the knee. This creates a very pleasing look, as it makes sense visually for it to end at that spot. It’s a great combination of styles. 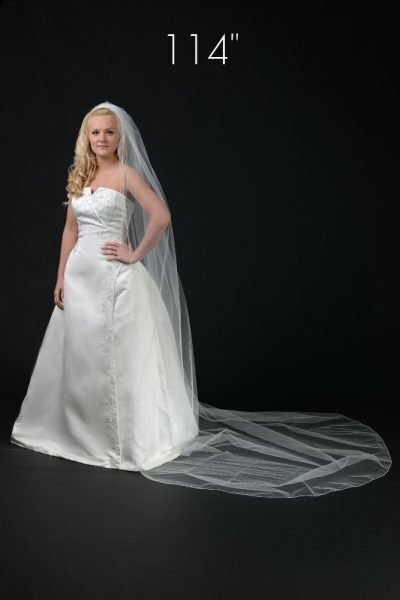 Another one of the most common veil lengths, two layer fingertip length – often described as a 72 inch in bridal shops – is a great option for many brides. 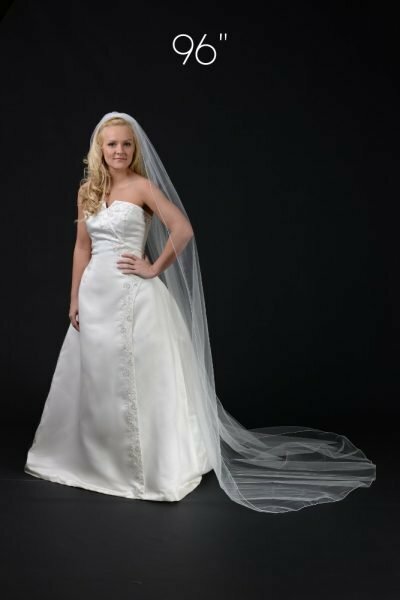 It’s long enough to look flowing and elegant, but without the difficulty of manoeuvring around in a trailing veil – which is totally worth it in our opinion! Depending on your height and where in your hair you wear it, it can end anywhere from hip to knee length. Floor length veils, though perhaps not as popular as chapel or cathedral length, are a great option for those who’d like a full length veil and whose gown is without a train of its own. The length of 78 inches equates to 6 foot 6 inches, so you could use your own height, plus heels, to figure out how much of it would skim the floor. But in general, it creates just a small puddle train. Great for slim boho style gowns which are often without train. The most popular length by far, chapel length, and the single layer version in particular, is by far the most popular veil length of the moment. We have more designs in this length than any other for that very reason. In your bridal dress shop, you may have heard this length called a 126 inch veil. It’s slightly more popular than the ultra-long cathedral length below. Could there be anything more classically bridal than a full length veil worn over the face? The reason the longest lengths are named after chapels and cathedrals is because they suit the grandness of those locations perfectly. They also make amazing photography props giving your photographer so many fun and pretty pose options, like trailing them down a grand staircase! Look. Some dresses, and some brides, for that matter, just need a cathedral length veil, okay? If an ultra-long veil has always been your dream, we say go for it! A veil that extends past the ends of the dress, particularly if it has lacey detail at the bottom, is just about as classically bridal as you can be, and we’re here for it. If you have the veil made in the widest width (108 inches) as well, you can create the most beautiful spread that will look ah-ma-zing in pictures! On a slightly more serious note, some trains do genuinely need a cathedral length veil. If you try to pair a chapel length veil with a cathedral length train, it’s going to end a good few inches shy of the end of the dress and look slightly strange. If you’re not sure if you need chapel or cathedral length, send us a picture of your dress, preferably taken from the side view, and we’ll try and calculate how many feet sit on the floor. We can’t guarantee we’ll be able to figure it out from a picture, but if not, we’ll let you know how to measure up next time you try the dress on. 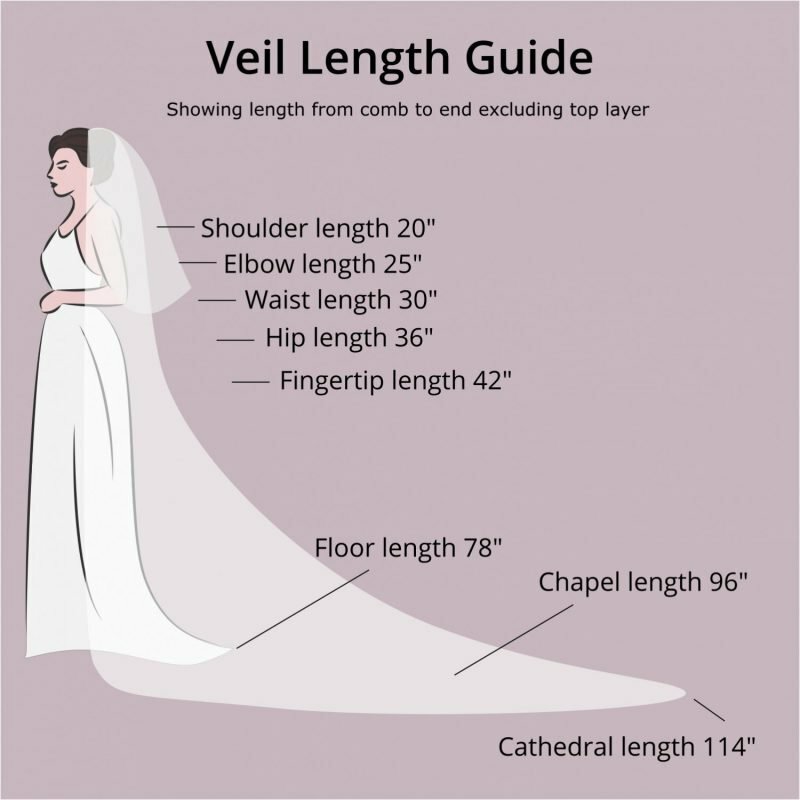 We hope you found our veil length guide helpful. Of course, there’s nothing quite like the personal touch. 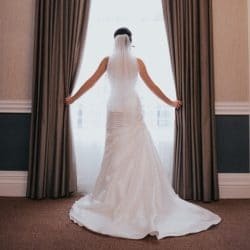 If you’re still hopelessly lost and need some one-on-one advice on what veil length to go for, just send us a picture of your dress and tell us whether you’re thinking of having a long (floor, chapel, cathedral) or short (shouder to fingertip) veil, and we’ll be more than happy to help. Be sure to also checkout our guide to veil widths and gathering. The other important factors in getting just the right veil shape and look.